What really excited me about Los Angeles is that it's pretty spread out. This isn't so strange to someone from the D.C. area, where the District's height limit has forced growth outward rather than up. But in many places there forms a critical mass of people and jobs and general stuff, creating what Joel Garreau called "edge cities." In his book of the same name, Garreau describes the edge city as a concentration of office and retail space that are not the major downtown of a city. They don't necessarily have to be outside the city limits. 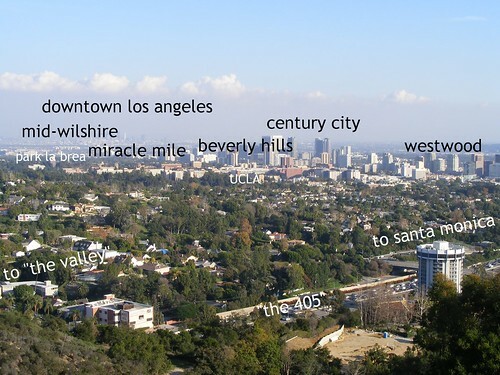 Of Los Angeles' twenty-three "edge cities" (according to Garreau), nine of them are within the city proper. Garreau counted twenty-three edge cities in the D.C. area as well, including Silver Spring and Bethesda. In the photo above, the blurry thing in the far background is Downtown Los Angeles, which isn't really the center of the city or the region. Moving west from there, you'll pass Mid-Wilshire, Miracle Mile (which dates to the 1920's), and Beverly Hills (which is a separate city). Century City is where the big buildings in the foreground are. To the right is Westwood, where UCLA is located. It's in these places, more so than Downtown, where Los Angeles does its business. And in a city renowned for its car culture, they can be surprisingly compact, dense, and even walkable. (Especially when temperatures don't dip below 50 degrees in December.) They feel like a city, with people and traffic and big buildings. But as the photo shows, they're surrounded by leafy residential neighborhoods filled with the ranch houses that Southern California is famous for. I realized that Montgomery County isn't all too different from Los Angeles, which has the same land area but four times the population. Wilshire Boulevard, lined with apartment houses and country clubs, could pass for Wisconsin Avenue with palm trees. And as Sligo pointed out in a comment, he got the idea to nickname Downtown Silver Spring "the Promenade" after seeing the outdoor Third Street Promenade in Santa Monica. And what is heavily Latino East Los Angeles but a really, really big Langley Park, where one can eat pupusas from out of a truck to their heart's content? People might want to lump MoCo in with super-crunchy San Francisco - Takoma Park did get its nickname "The People's Republic" from nearby Berkeley - but after visiting both, I definitely found more that reminded me of home (or just more of everything) in Los Angeles. That is the only thing Silver Spring and Santa Monica have in common, though. MoCo should further emulate the Promenade by closing Ellsworth permanently, IMO. If you care about Countys future, you should support Becky Wagner for Council AtLARGE! Go to www.beckywagner.org to see hre great views! Thus begins the 2010 election cycle.